New H and R Focus RS Mk3 Anti Roll Bars / Sway Bars. Sport Sway Bars are crafted from a special (hf) 50CrV4 steel alloy—the highest tensile strength available. The quality of the material and design guarantees smooth transitional sway bar function—decreasing the feedback response time—and increases stiffness over stock. H&R Sport Sway Bars improve a vehicle’s lateral stability and cornerning grip, while reducing body roll.H&R Sport Sway Bars are precision engineered—designed and manufactured to be strong, resilient, and durable. Adhering to the same manufacturing philosophy as H&R’s world-renowned springs, H&R Sport Sway Bar design and production receives significant attention to detail and commitment. 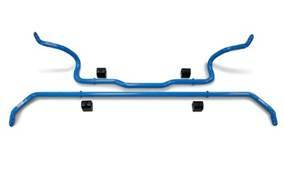 Each sway bar is cold-formed and heat-treated, with forged seamless bar ends. H&R shot-peens the sway bars to increase durability and check for dimensional correctness. At H&R’s ISO9001 certified manufacturing facility in Germany, production is completed in-house and each sway bar must pass a series of rigorous quality control tests to earn H&R’s approval and yours. The Pumaspeed Workshop team are ready to fit the MK3 Focus RS Full Anti Roll Bar Kit By H&R ( in stock) in our Head Office located here. Therefore making parts and labour a total cost £683.00 (inc. VAT). Pumaspeed have a specialist distribution team that can dispatch the MK3 Focus RS Full Anti Roll Bar Kit By H&R ( in stock) to any destination worldwide.